I’m a very private person, especially when it comes to doing something in public that is seemingly foolish. And what I regard as foolish is showing off my body in any way, dress, or motion in which it isn’t reasonable to be shown. I will not, for example, trot down my neighborhood in my bathing suit unless I was covered by multiple layers, and the same goes for the beach! That I ever get a tan is a marvel, although my nose regularly gets burnt. I will also not participate publicly in gymnastics, one of which includes picking up a quarter near a bus stop, which is not graceful for a periodically stiff, 69 year old woman. And I continuously die of embarrassment when contorting in and out of our two-seat, Ford truck, with its mid-hip height floorboard. Boarding New Jersey Transit Buses, with their platform-high first step, provide similar experiences. Privately, however, I exercise. Not yoga. Not Pilates. Not exer-cycling or treadmilling. What I do is dance, with me as my own choreographer. Now then, I gather from pictures in the NY Time’s Arts Section, Entertainment magazine, and The Inquirer, when a woman shows off her dancing body in public, that body should wear size 0, almost-not-there clothing. This seeming convention violates two of my principle behaviors; the love of eating more than I can burn off, and my insane desire to cover up. Home, however, relaxes my inhibitions. In my sixth floor Weehawken, New Jersey, apartment, surrounded by picture-window views of Midtown New York, I dance as though I regularly fly across Broadway stages. I become a star at twilight, when Manhattan’s sky turns bright navy blue and the day-glow light from the Empire State Building’s crown transforms the sky. If I didn’t wear headphones while I danced across my living room carpet, I am sure that I would be able to hear the applause from everyone living across the Hudson River who bothered to train their binoculars on my windows. And then, completely by accident, I heard the music entitled “Ghost Dance” by Cusco. Suddenly, I developed the urge to dance outside in public. Luckily, this urge occurred just prior to a two week, early-March stay at Treasure Island, Florida, on the Gulf of Mexico. Our hotel fronted one of the deepest stretches of beaches on the Pinellas County Barrier Islands (west of St. Petersburg), which, because of location and season was relatively unpopulated. And dance I did. My costume for this bit of pleasure? My standard black, loose-fitting Tee and jeans. No glitz. No scarves. No jewelry. And no skin. My “peer,” Joan Rivers would not have approved, but everything else about the experience was transformative. In the middle of the sand, I leaped, twirled, invented fancy footsteps, did the moon-walk, and executed fluid arm movements. For 15 to 20 minutes a day, I performed a performance that only I could understand. Yes, others saw me shift around, but without music to match motion with emotion, I assume that to them, I simply looked odd. My soundless dancing did, however, attract Herons and miscellaneous seabirds who positioned themselves in a circle around me. As long as I did not look these birds in their eyes, they watched me, stepping closer and closer until they stepped too close for comfort. And the sun watched me, too. The sun, in fact, was one of my biggest fans and rewarded me by burning my nose. 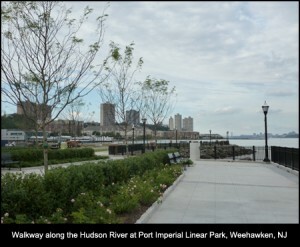 Now that I have the courage to dance in public, my next outdoor performances will begin in early summer at a location across the river from Midtown New York at Port Imperial Linear Park, Weehawken, NJ. Whether NY City residents will applaud is yet to be heard. I’m sure Weehawken residents will stare. If you want to know what I’m about as a person, listen to Ghost Dance, followed by Montezuma, Inca Dance, and Waters of Cesme, all by Cusco. This music is available on Amazon.com, YouTube, and sources identified by Googling. Strangely, Cusco is not available on iTunes. For more information about Cusco, a German cross-cultural band named after the Peruvian city of Cusco, check Wikipedia – http://bit.ly/32r5VY. Since I first was exposed to this band in early 2013, their official website has disappeared, but their music lives on in a lot of places. Karen Little is a writer, programmer, and illustrator, specializing in technical material and travel articles. 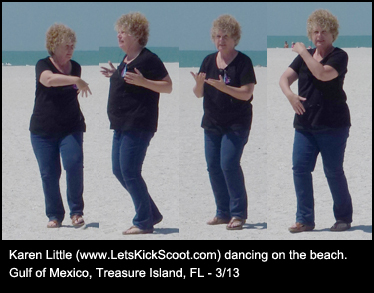 She is also the current queen of adult kick scooting (crowned by herself). Karen publishes www.LetsKickScoot.com and the moribund www.Littleviews.com. In one of her many past lives, she founded and ran Office Technology Academy (Milwaukee, WI), which helped highly-intelligent-but-low-income people obtain computer skills and jobs. She also founded Clear Concepts, a technical documentation company, and published a number of books and manuals. She’s now actively doing other things. Note that as one of the first women “online,” Karen has been involved in bulletin board services and Internet forums since the means to host them was invented. She types faster than she talks. I liked this and it made me think, have you heard of 5 rhythms dance practice? If you fancied dancing with others in a free form way. Have a great day!